The Poet Laura-eate: NIMBYs Unite - Your Country Needs You! NIMBYs Unite - Your Country Needs You! It started with this Daily Mail lead letter from George Rome Innes. A week later mine was printed below. We need more NIMBYs. And let's face it everyone's a NIMBY when it's THEIR back yard. Fact. But everyone should care about what is in their back yard And what is in their front yard too. Let's make NIMBY a badge of honour, not a term of abuse. It is just a criticism to shut down debate anyway. But the more debate the better. All too often tax payers are presented wtih a Hobson's choice of abysmal planning options to choose from, if any choice at all. 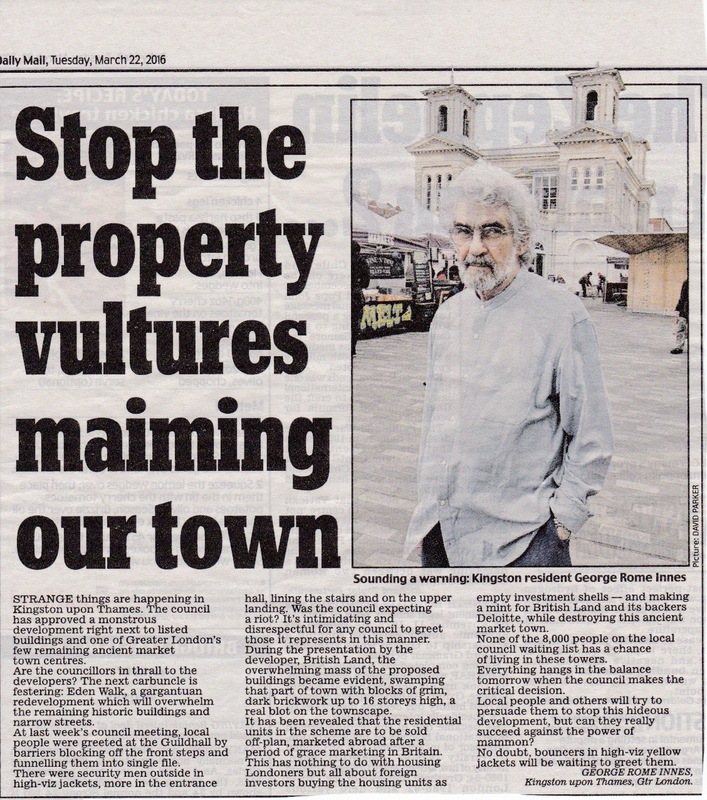 I say towns and cities are for people, not developers or corporations who seek to play Monopoly with our lives, strip us of our assets and sell us short, never mind quite happily bulldoze everything about Brighton and Hove that makes it special. Even the Royal Pavilion has suffered serious threats to its existence twice in its history. It has got to the point in Brighton where families born and bred in this city are being urged to move elsewhere as the city can no longer 'afford' to accommodate them. Meantime our council has plenty of money for silly road schemes that no one wants while they neglect upkeep of our seafront, close our libraries and lavatories and tell us we have to face a future of high rise developments on our seafront and the construction of 'Greater Brighton' cutting a swathe through our city. Good for you. I'll join you when you lash yourself to the Sackville Hotel as wreaking balls try to reduce it to rubble. I knew the place as a kid. 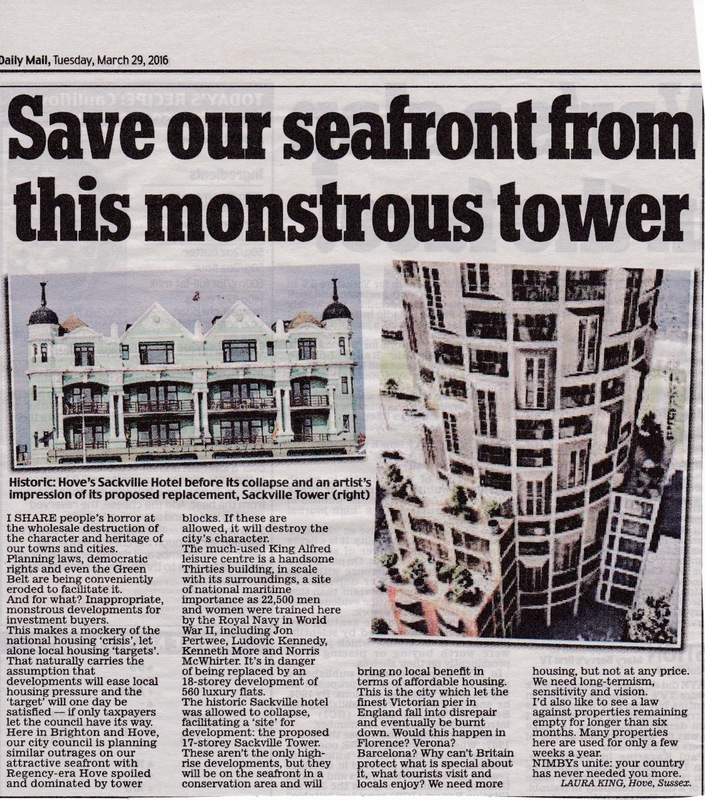 Mind you the ruination of Brighton and Hove is not new. The hideous shopping precinct near the Clock Tower on Western Road went up in the late '60's. ...And of course the wealthy developers never live or shop in the monstrosities they put up.